Back to Breathing was created to help Mister Tea deal with the horrible sinus infections he used to experience with regularity. Prior to having this tea in our ‘herbal medicine cabinet,’ antibiotics and pain-killers were fairly common for him. Certain times of the year, like clockwork. The tea has been a saving grace for both of us. As we got more feedback on the tea, and more requests for various specific condition teas, we discovered something interesting. Both in practice, and through my research, this is also an effective tea for asthma, as well as for the respiratory side of colds and flus. The primary herb in this mix is Coltsfoot. It has long been used to break up mucous throughout the respiratory system, but is more effective for blockage in the sinuses than other respiratory herbs. It is the most effective herb I have worked with for dislodging the cold-crud that leads to those extraordinary cold-headaches. It also works as the best kind of expectorant, calming the throat when things have advanced to the point where it feels like you can do nothing but dry-cough, but encouraging productive coughing. Coltsfoot was well known enough that the symbol for it was used for apothecaries. The secondary herb in this tea is Peppermint. 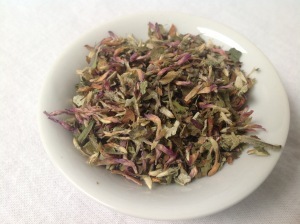 It shares the mint family with Coltsfoot, although the two of them have different specializations, making them a wonderful pairing in this tea. Peppermint acts as both a mild stimulant and a digestive aid – helping to combat both the fatigue caused by a cold and the nausea that can hit you due to drainage into your stomach. The blender for this tea is one of the “big four” nutritive herbs, and also has beneficial effects on the conditions this tea was created for. Red Clover has mild antiobiotic properties, and through this lends extra strength to the infection fighting properties of the Coltsfoot. It is also a mild expectorant in its own right, and helps with the expulsion and loosening of mucous. Red Clover also acts as a nervine and detoxification agent, and can assist with the aches of colds and flu, as well as helping the body to clean out the toxins left behind by sickness, fatigue, and pain. 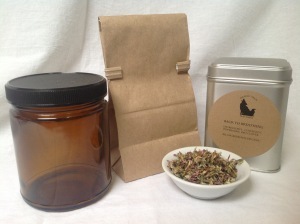 Lastly, and perhaps best, Red Clover lends a bit of sweetness to the tea, and evens the flavour of the two mints, making this tea fit into our goal of simple medicinal teas that you will actually want to drink. This entry was posted in Medicinal Teas and tagged Breathing, Herbs for Asthma, Herbs for Sinuses, Organic Coltsfoot, Organic Herbal Tea, Organic Medicinal Tea, Organic Peppermint, Organic Red Clover, Organic Tea, Sinus Infection, Tea for Asthma, Tea for Sinuses by DesertSage. Bookmark the permalink. Received this today (a day early). Sinus season is kicking my behind and I needed extra help this year. Back to Breathing (B2B) tea is my go to tea on those “just can’t breath” days.